SAN FRANCISCO (Reuters) - Abercrombie & Fitch (ANF.N) has kept its cool in a recession, selling its pricey clothing at a premium. But a steady sales decline is making investors argue the brand must be practical -- and start to discount. The teen retailer, known for its billboards with near-naked male models, has stuck by its full-price strategy even though shoppers have proven their interest these days is only piqued by steep markdowns. Some investors and analysts say it is time to reconsider. "We're in a different consumer environment. We're in trench warfare with the consumer," said Jefferies & Co analyst Randal Konik. "My fear is you have companies in the aspirational segment with aspirational price points ... that are having real struggles." Abercrombie, along with top retail names like Coach Inc (COH.N) and J Crew Group Inc (JCG.N) might have a hard time lowering prices, given years of casting its brand as a higher-priced, luxury alternative. But Abercrombie could also be overly worried that promotions would tarnish its image. Even the most luxe names are cutting prices, said Konik, who rates the shares a hold. "When you have Gucci on sale, Prada on sale, Neiman's on sale, everyone in the mall is on sale ... it's not totally a bad thing to be on sale," he said. Once the teen sector's high-flyer, Abercrombie is now posting the most dismal sales results within the group and ceding market share to lower-priced rivals like American Eagle Outfitters Inc (AEO.N) and Aeropostale Inc (ARO.N). On Thursday, Abercrombie warned its fourth-quarter profit would fall significantly short of its own forecasts after reporting December same-store sales fell 24 percent. That made the company the worst sales performer in December out of 35 companies whose results are tracked by Thomson Reuters. The New Albany, Ohio-based company has posted double-digit same-store sales declines since August, including a 28 percent drop in November at the start of the holiday shopping season. Abercrombie's shares trade close to $21, down from a high of more than $82 hit in February. They are also down 70 percent from a year ago, compared with declines of 44 percent at American Eagle Outfitters and 25 percent at Aeropostale. "It's certainly hurting them in the short term, as you can tell," said Ken Perkins, president of retail research firm Retail Metrics. Chief Executive Mike Jeffries, on a November conference call with analysts, defended the company's stance. He said promotions would not be used to drive sales and markdowns would be used only to clear through end-of-season items. "It is clear to us that the short-term relief provided by the use of promotions is more than offset by the damage inflicted on the brand in the long-term," he said. "Promotions are a short-term solution with dreadful long-term effects." 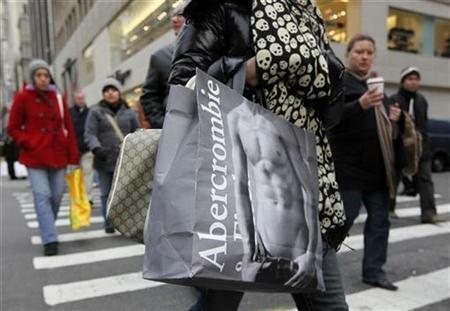 Abercrombie's general counsel, David Cupps, said this week that the company had no plans to change its selling strategy. Needham & Co analyst Christine Chen, who herself agrees with Abercrombie's stance and rates the shares a "buy," said the pricing strategy is proving harder for investors to digest. "More people disagree with it than agree with it. There are very few investors I talk to who like this full-price strategy," she said. "I like the long-term strategy of trying to not be promotional because if they want to remain the luxury name in the teen space, they need to stick with that," Chen added. "If they didn't have the cash flow I might disagree with it." Still, Abercrombie faces a major risk if the U.S. recession lingers, said Retail Metrics' Perkins, warning that a whole new group of young consumers could grow up and become accustomed to shopping at rivals that offer lower prices. Morningstar analyst Brady Lemos said Abercrombie should consider more promotions at its surf-inspired Hollister stores, which has more stores than the main Abercrombie & Fitch chain and caters to a younger crowd. That would encourage sales, while preserving the integrity of the namesake brand. "They're using the Abercrombie & Fitch model for all their concepts and that might not be the best strategy in this environment," Lemos said. The fashion retailer’s new CEO, in charge from the end of 2018, is building a team with an international outlook around herself, with notably three new arrivals to bolster the company’s turnaround. The Americans jeans maker said on Monday it expects to raise as much as $587 million through an initial public offering, giving it a value of up to $6.17 billion as it returns to the market after three decades.